This cheesecake I made when I first got married, around 14 years ago. I misplaced the recipe and I came across it again the other day, so I had to make it. As it was a friends birthday also that day I thought I'd make it and share it with her. 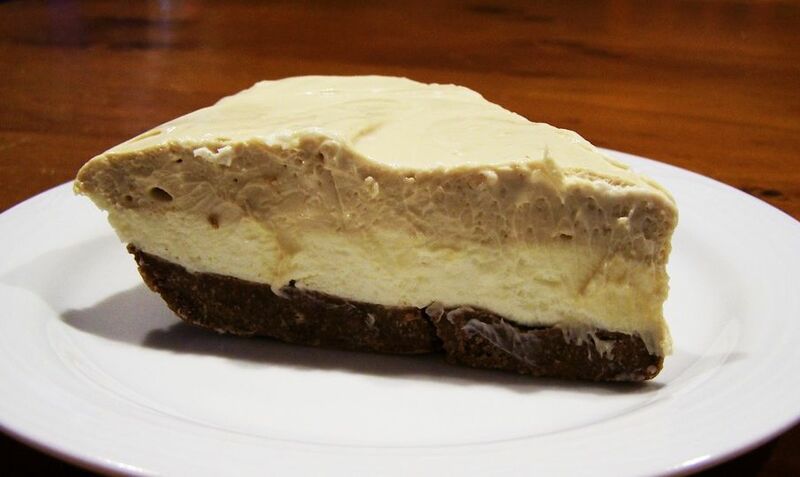 This is not a difficult cheesecake to make, and below I will tell you a few things that I found with cheesecakes (not to complicate matters or to deter you from making it) but just to guide new cooks that if they don't like all bits of a recipe you can make small changes. The first time I made this I new it had the potential to be a cheesecake I loved, but I found I did need to alter a few things. At first I was not happy with the biscuit base, way to greasy-there was way too much butter. So after tweaking it, I think I got it right. But remember when you try it yourself you can add more or less butter, you just have to have enough butter to hold the crumbs together, to dry and they will fall apart when serving. Too oily and it is just horrible, the crumbs become hard and over buttery, it is unpleasant. Each biscuit type needs a different amount of butter, so as a rule just add the butter in slowly until you are happy with the consistency. With regards to the filling, initially I loved the flavour, but I found it had slightly too much gelatine in it for me. So the second time I decreased it slightly, if you don't have enough gelatine, the cheesecake won't hold together. 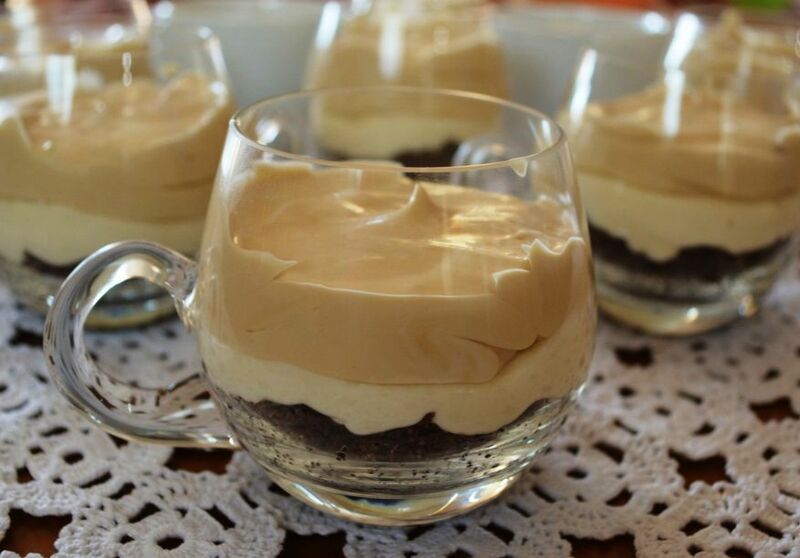 Originally the recipe said to use 1 tablespoon gelatine, so I have stated it in the ingredients list and you should use that measure the first time if making individual cheesecakes, it was still really really good, but if you find it is too much, decrease the amount next time like I did. When I decreased the gelatine amount to 7g, I made one big cheesecake that set perfectly, but I did not try it with individual cheesecakes. Now these can be made individually in 100ml muffin tins, it will make around 12 of them. Or you can (and this is the far easier option) make it in a 20cm springform tin or a 32cm x 22cmx 2cm rectangular tin. Another really safe option is to make it in a glass, looks amazing and is a safe and easy option. Either way it is a lovely looking cheesecake, with a creamy filling that just melts in your mouth. Grease 2 x 6 hole (100ml capacity) muffin pans. Cut small circles of baking paper (the size of the base) and line the base with the baking paper circles. If you are using a 20cm springform tin or a 32cm x 22cm x 2cm baking tin, line the base with baking paper. Process the biscuits until finely crushed. Pour into a mixing bowl, add 3/4 of the butter, mix to combine, if the mixture is dry add more butter, but I only like to add enough for the mixture to not be dry. Divide the mixture into the muffin tins, you need about 1 tablespoon of the mixture per hole, press down firmly. (If making it in the round or rectangular tins, just spread the mixture out evenly, pressing the crumbs down. Cover; refrigerate while preparing the filling. Filling: Sprinkle gelatine in a small heatproof bowl, add the water. Place the bowl over a saucepan of simmering water, stir until the gelatine has dissolved, remove from heat to cool while you make the rest of the filling. Dissolve the coffee in the hot water, allow to cool while you continue with the filling. Beat the cream cheese and sugar in a small bowl of an electric mixer, scrape down the sides once, until well combined. Add 1/2 cup of the cream, beat until smooth, you will need to scrape down the sides once or twice. Using clean beaters beat the remaining cream in a small bowl of an electric mixer until soft peaks form. (I find you should do this part before beating the cream cheese so you don't need to wash beaters). Beat gelatine and extract into cheese mixture with beaters on medium speed. Fold in the whipped cream. Pour over half of the cheesecake mixture over biscuit bases. If making the individual cheesecakes, make sure you leave enough space for the coffee layer. Fold the coffee mixture into the remaining cheese mix. Spread over the cheese mixture in the tins. Cover; refrigerate overnight. Make the chocolate shapes: Melt the chocolate in a heatproof bowl placed over a saucepan of simmering water. Pour into a piping bag. Line a baking tray with baking paper. Make a small slit in the tip of the bag and pipe four lines one way over the baking paper, followed by four lines the other way, as in the photo below. this does not need to be perfect. Refrigerate until needed. To serve, carefully run a knife around each cheesecake to unmould. It should come out relatively easily. For the round or rectangular cheesecakes, just slice and serve.